Created by Robert Trent Jones, Sr., the renowned Mauna Kea Golf Course offers players incredible panoramic views of sea and land as well as the opportunity for a challenging round of golf. Consistently ranked in the top 100 golf courses since 1969 and one of America’s “Gold Medal” golf courses, as rated by Golf Magazine, Mauna Kea has been renovated under the direction of Trent Jones’ son, Rees Jones. 18 holes. Par 72. The Arnold Palmer/Ed Seay-designed 18-hole championship Hapuna Golf Course is nestled into the dramatic natural contours of the land from the shoreline to about 700 feet above sea level. The course features spectacular views of the Kohala Coast and the Pacific, with sometimes snow-capped Mauna Kea volcano as a backdrop. 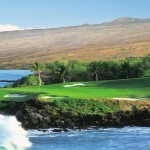 Hapuna’s challenging play and environmental sensitivity make it one of Hawaii’s most unique golf courses. 18 holes. Par 72. Exciting new package for 2011 where you’ll enjoy luxury accommodations, championship golf at two courses, plus a generous resort credit to experience even more! To book, please call 1-888-9-PRINCE and ask for the Stay & Play Package. An exciting new package for golf enthusiasts! Enjoy luxury accommodations, championship play at two golf courses, plus a generous resort credit to experience even more!